Whenever we ecotoxicologists have something to present to the big audience, we participate the meetings organized by the society of environmental toxicology and chemistry SETAC. 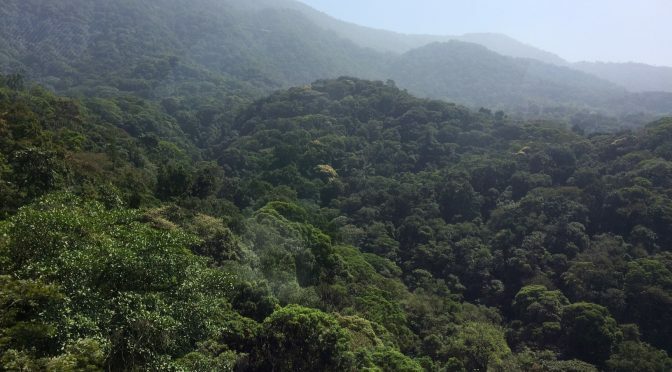 The mission of the society is to support the development of principles and practices for protection, enhancement and management of sustainable environmental quality and ecosystem integrity. Additionally, SETAC promotes the advancement and application of scientific research related to contaminants and other stressors in the environment, education in the environmental sciences, and the use of science in environmental policy and decision-making. 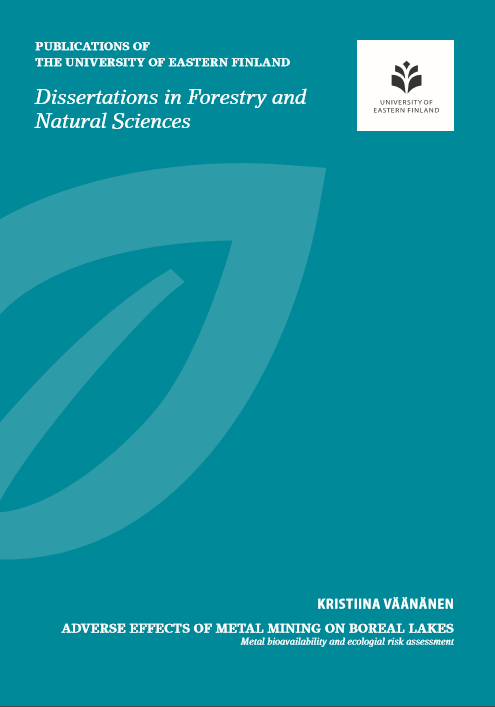 The society also provides a forum where scientists, managers, and other professionals exchange information and ideas for the development and use of multidisciplinary scientific principles and practices leading to sustainable environmental quality. 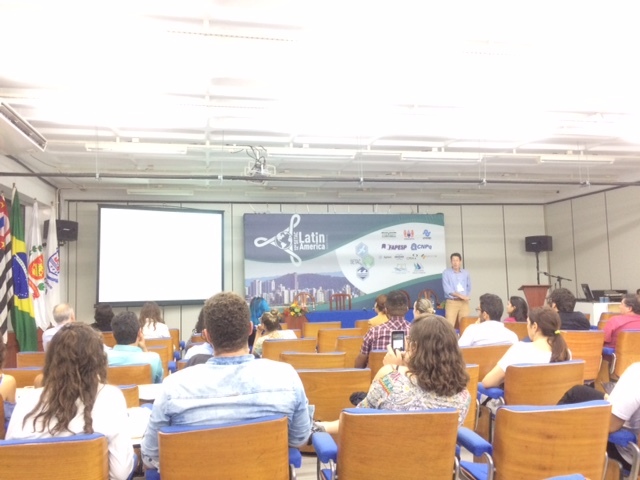 SETAC audience discussing microplastic pollution in Santos, Brazil. Annual meetings of SETAC take place annually or biennially in different geographical regions, and our group members mostly participate the European and North American annual meetings held every year, as was the case also in 2016 and 2017. 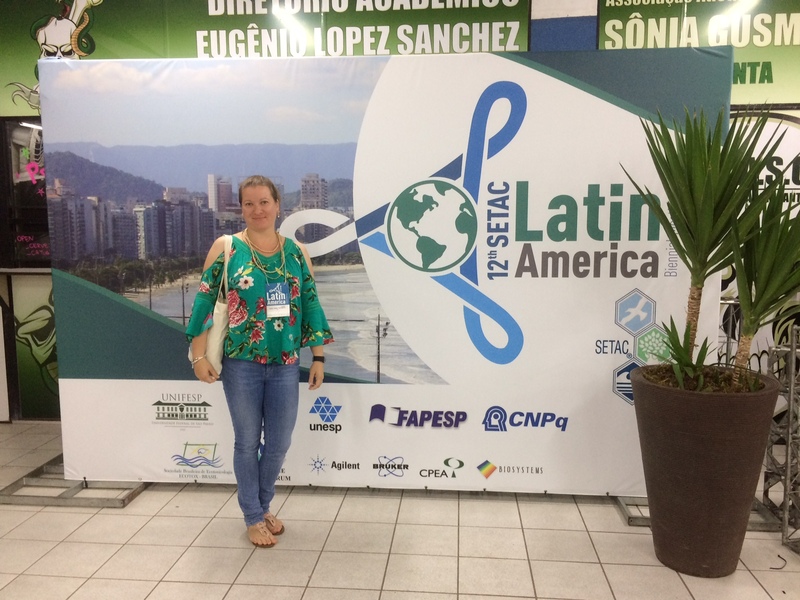 SETAC Latin America organized a biennial meeting in September 2017, and I had an opportunity to participate such an event for the first time. My previous SETAC experiences were from three North American meetings, so I thought I could somehow imagine what to expect. But after all, the experience was far beyond that I could ever have imagined beforehand. SETAC Latin America 12th Biennial Meeting is about to start. Whereas the North American and European SETAC meetings have about 2000-3000 participants yearly, SETAC Latin America 12th Biennial Meeting this year gathered just about 500 participants. Altogether 17 countries were represented, and a few participants, like myself, came across the ocean from Europe and Asia – me being the only one representative from UEF and the whole Finland. 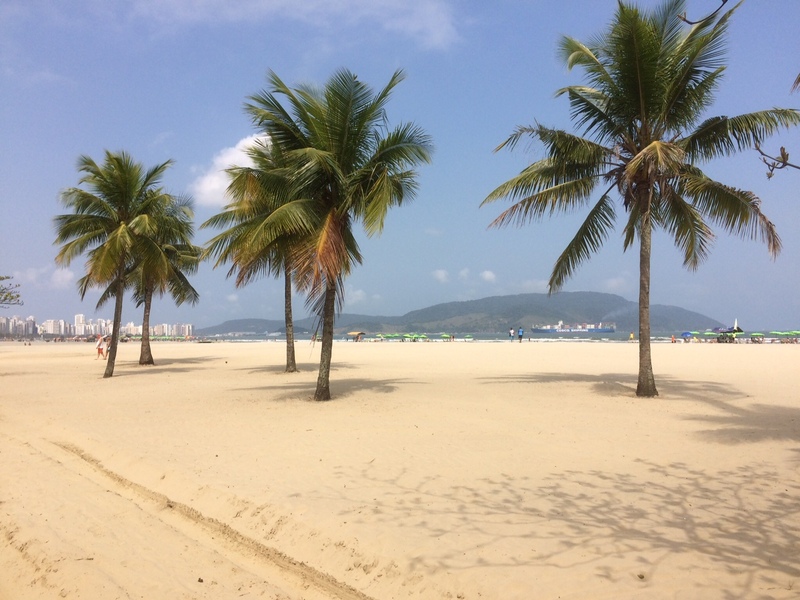 The conference was held in Santos, a coastal city in São Paulo state in Brazil. Everything was smaller and simpler compared to the NA and European meetings – more intimate and informal somehow. In my opinion it was easier to meet new people, get to know them, and talk about science and beyond. Just the fact that I came from Finland, already created an interesting base for various discussions during the sessions, lunch breaks or just in an elevator going from the 1st floor up to the 5th. I got so much courage and confidence about myself by traveling alone and being forced to integrate to the community beginning from the inaugural session. I did not know anyone from there before traveling, but when I came back, I had many new friends and experiences to take home. 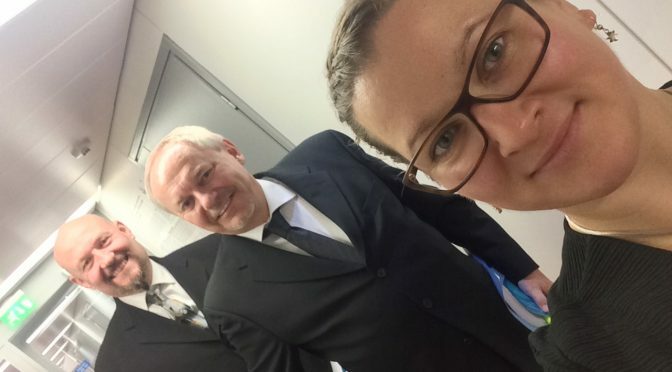 Who knows, maybe we will have some co-operation with our Brazilian colleagues in the future!? Definitely not the worst place in the world to attend a scientific conference! This was the first time ever that I participated in a conference with three official languages: English, Spanish and Portuguese. Most Latin Americans gave their presentations in their own language, mostly in Portuguese, naturally, because the conference was held in Brazil where most of the participants came from. Fortunately I could understand all three languages, but I felt pity for the North American, European and Asian participants who could only follow the slides, which in most cases were in English though. Q&A part was a mixture of all three. Extremely confusing, but interesting. 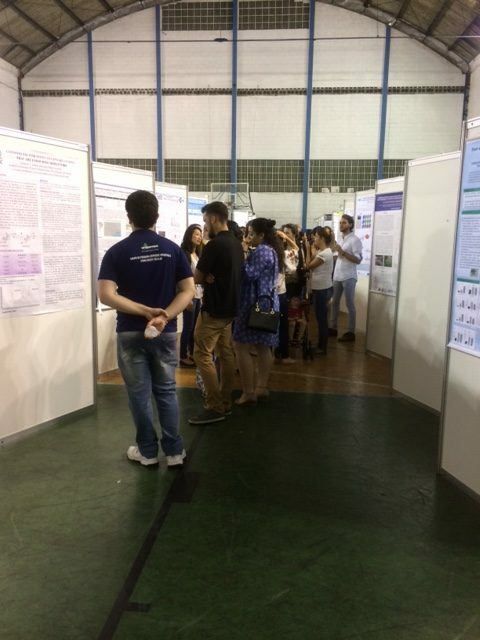 The actual conference days consisted of platform presentations in the morning, lectures and round table discussions in the afternoon, and poster sessions at 6-8 pm. Lunch breaks were long and gave a nice opportunity to have a little runaway to the beachfront closeby before the next session. Poster session of the 2nd conference day. My impression was that the hot topics in ecotoxicology in Latin America are the effects of pesticides to the environment (agriculture is strong in LA) and topics related to pollution of the ocean. Metals and nanomaterials are only now making its way to the Latin American field of ecotoxicology, whereas in Europe and North America they have been a hot topic already for several years. 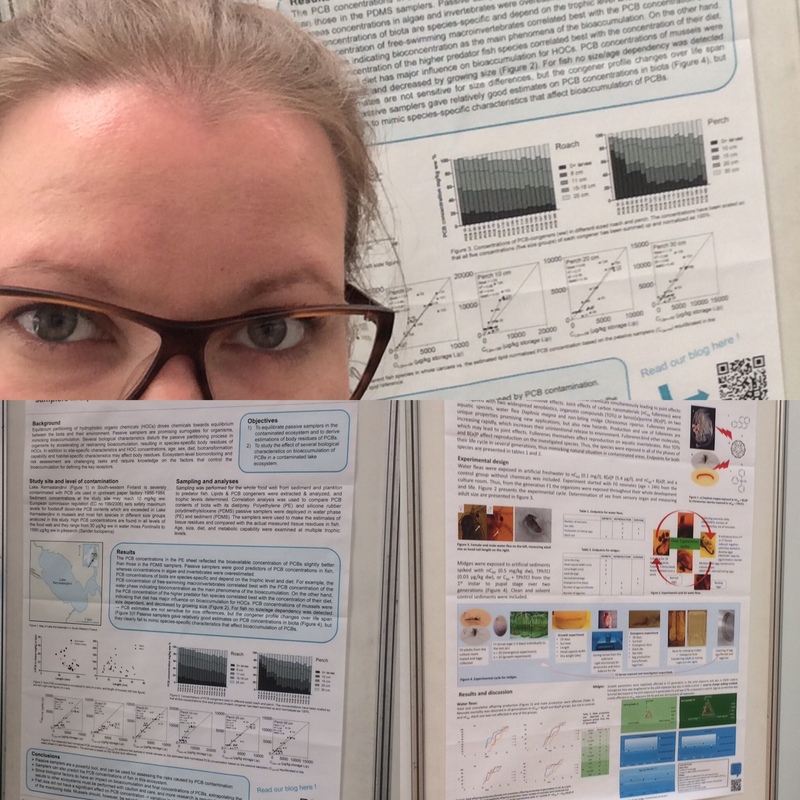 I took with me two posters from Finland, one about my own research about PCB bioaccumulation and passive samplers, and another of Kukka’s and mine, about joint effects of traditional xenobiotics and nanoparticles on aquatic species. The poster session was a success: many interesting dialogues I had, and many new friends I made. This was also the first time that I could present something in my second best language: Portuguese. Everything went better than I excepted, and next time in SETAC Latin America Biennial Meeting, which will be held in 2019, in Cartagena de Indias, Colombia, I will definitely encourage myself to have a platform presentation in that language, too. 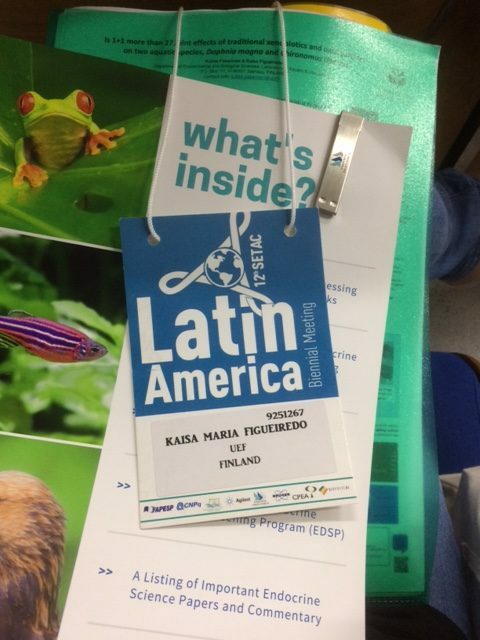 This experience was a wonderful experience as a researcher and gave an interesting insight into ecotoxicology in Latin America. This was also a prefect getaway from my daily routines in order start preparing for my PhD defense, which was about to follow soon after coming back home. 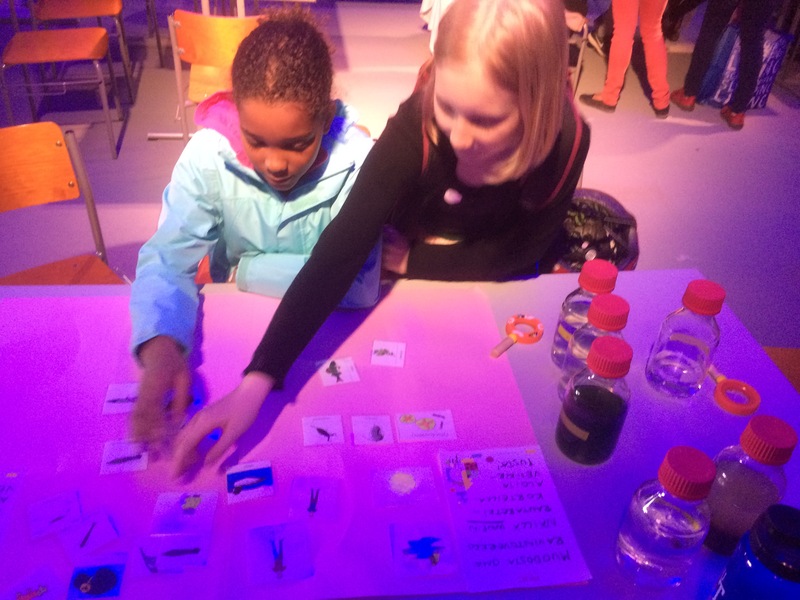 The conference trip was financed by Unipid FinCEAL+ program for international mobility between Finland, Europe, Africa, Asia, and Latin America and the Caribbean (LAC), financed by the Finnish Ministry of Education and Culture. 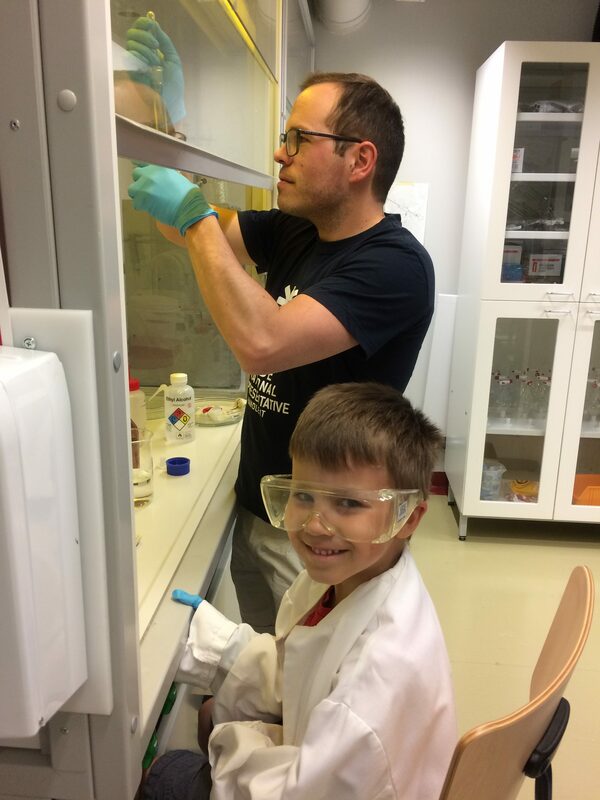 The great adventure has also been documented on Instagram and Twitter @uef_ecotox. 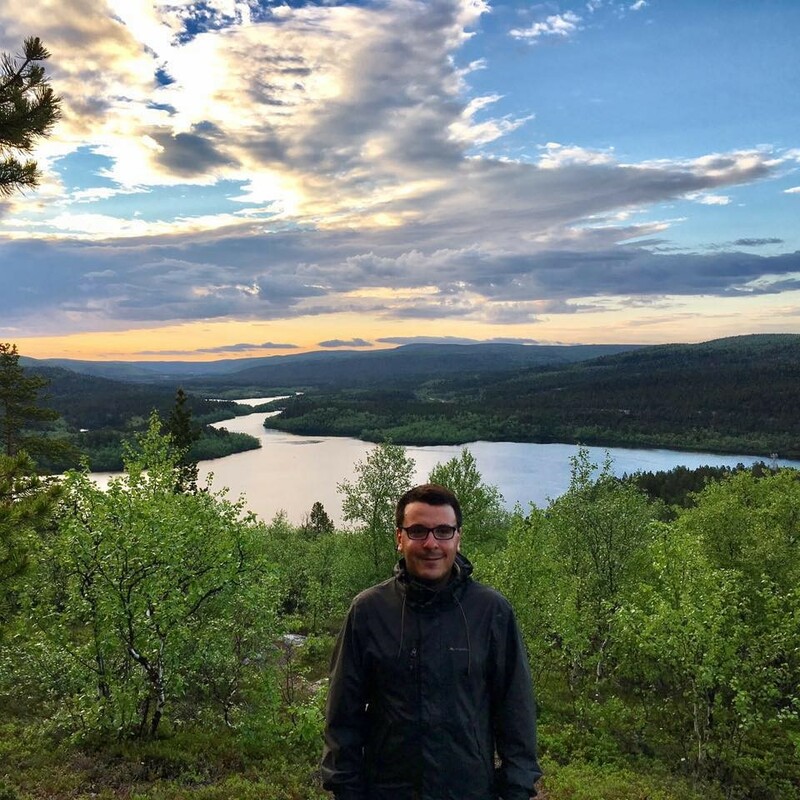 This is Joan, a Spaniard environmental scientist ,who was born some years ago in a very small village called Moixent, located in the southwestern part (the warmest area) of València, Spain. My experience in Joensuu goes back more than 5 years, when in September 2012 I landed in Helsinki after being accepted as an exchange student for the whole academic year at the University of Eastern Finland. I still remember that long journey: Moixent-Madrid-Oslo-Helsinki-Joensuu. Yes, it took more than 24 hours to arrive to my new apartment, located firstly in Tikkarinne, and later on in Karjamäentie. New city, new people, new food, new culture, new language… and of course first time studying for part of my Bachelor’s in English (quite challenging at the beginning I must admit). Back then, I took a couple of courses in aquatic ecosystems taught by Dr. Jarkko Akkanen, who without knowing then, would later become the supervisor of my Master’s thesis. Furthermore, in one of the courses, I had the pleasure of meeting Sebastian; but, I will talk about him soon. I hardly realized it, and May 2013 arrived. 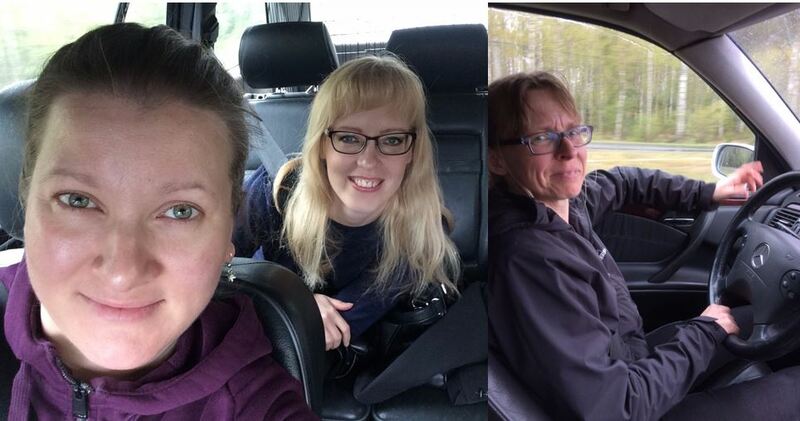 31st of May, the time to pack, to say “see you soon” to a lot of wonderful people…It was the time to start another 24 hours’ journey back to my hometown (drama, drama), but keeping in mind just one thing: I will be back in Joensuu, sooner or later! The last academic year of my Bachelor’s started in September 2013. 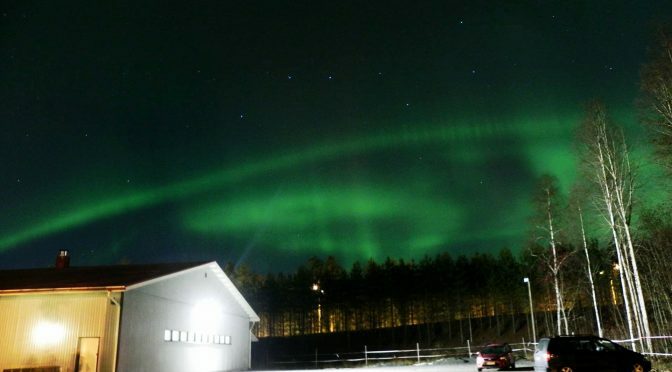 As you can imagine, half of my heart was left in this amazing city; quite close to the Russian border, and surrounded by lakes and hectares of forest where you can enjoy the Northern lights. Just one mission on my mind: get my Bachelor’s diploma as soon as possible and apply for a Master Programme at the University of Eastern Finland. 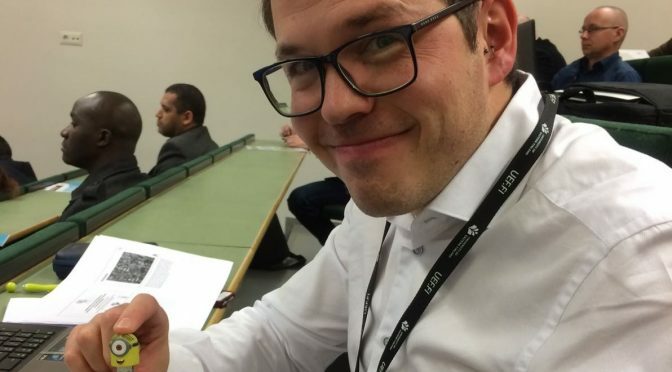 I didn’t tell anyone (not even my parents), and in May 2015 I got a letter at home: “Dear Joan, it is my pleasure to inform you that you have been accepted in a 2 years Master Programme in Environmental Science at UEF”. Yeah, August was the month to pack again, apply for a new flat and look for the fastest way to get to Joensuu. This time it took 10 hours, not bad at all (you learn from your experiences)! The academic year started in September, and I was fully ready to meet old and new friends, learn as much as possible, and enjoy every single day of this opportunity. First year of the Master was complete, and at this point, it was the moment to choose the topic of my thesis. After being trained in different research groups, I made a decision: “I want to do the thesis in the Aquatic Ecotoxicology Group”. So, after some informal meetings with Jarkko and Sebastian (yes, the guy that I met in 2012, became my second supervisor), we got a topic: “improved application system for activated carbon based sediment remediation”. 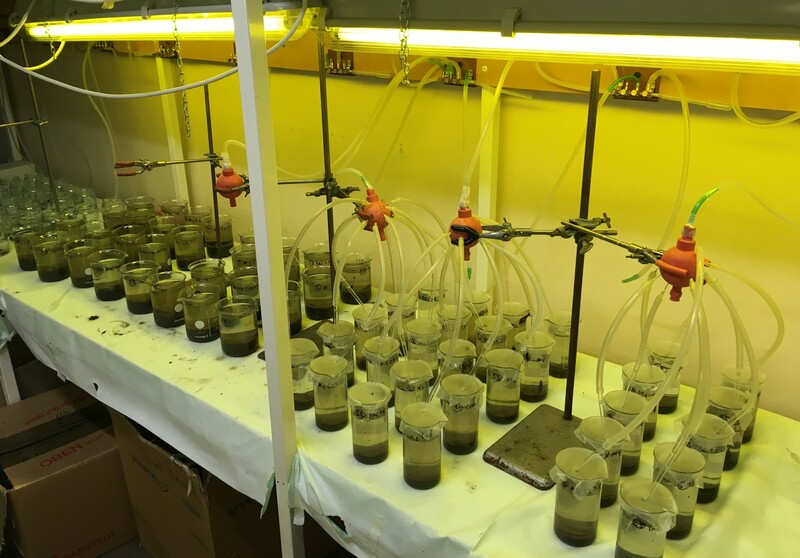 Briefly, we are evaluating the efficiency of granular activated carbon vs. carbon pellets to verify which one has better remediation capability (PCB bioaccumulation) by causing fewer unfriendly effects on the aquatic community (Lumbriculus variegatus has been used as toxicity test organisms). In the laboratory I had the chance to meet the other colleagues of the group: Marja, Kukka, Kaisa, Kristiina, Bhabishya, Victor and Eric. I have to thank you all for being such a great group of people and for all the help (specially, in making you some space at the office by taking boxes)! Experiments were finished by the Ilosaarirock 2017 weekend and currently I’m in process to write the thesis. Nowadays, this process is being done in Denmark, where I moved at the beginning of January 2018 for a four months’ internship on microplastics remediation at the Nordcee Institute, University of Southern Denmark. 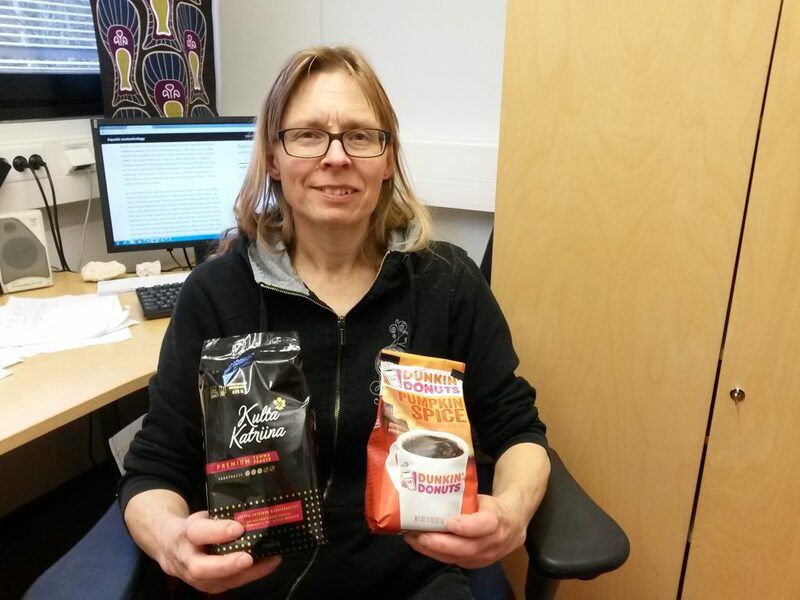 Don’t think I have forgotten you, because Joensuu and the Ecotox Group is each single day in my mind, and I will do my best to be back in town and continue my career with the group! Thanks all of you for accepting and for giving me all the knowledge in Aquatic Ecotoxicology! On the 14th of March in 2017 I left Valencia with 30 degrees, nervous but excited, because I knew that an amazing experience was starting. I arrived in Helsinki, and after some delay I landed in Joensuu, where it was full of snow and 50 degrees lower than when I took off. Someone that I didn’t met before was waiting (some hour more because the delay) for me at the airport, Sebastian, who took me to my new home. I couldn’t get in this house if Kaisa hadn’t taken the keys at Joensuun Elli student housing office. 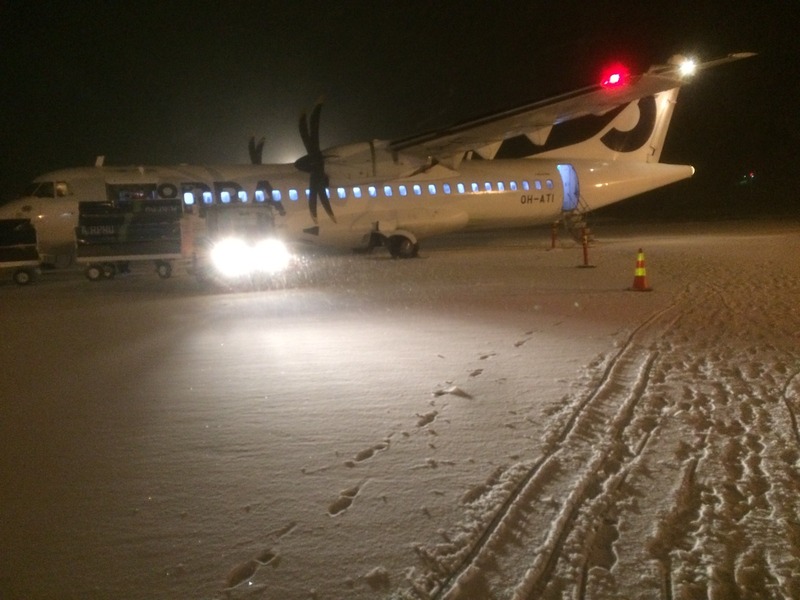 Landing on the snow at Joensuu airport. Next day, the experience at the UEF started. Kaisa picked me up, and before arriving to my new office and getting to know my new colleagues, Kaisa went with me to do some bureaucracy. We arrived, and after showing me the laboratories, she introduced me to Kukka, Kristiina, Joan and Bhabishya – all colleagues from the research group. It was time for a coffee for me but lunch for the Finnish people. After this, we made a tour for some high school students that came to visit the laboratories. 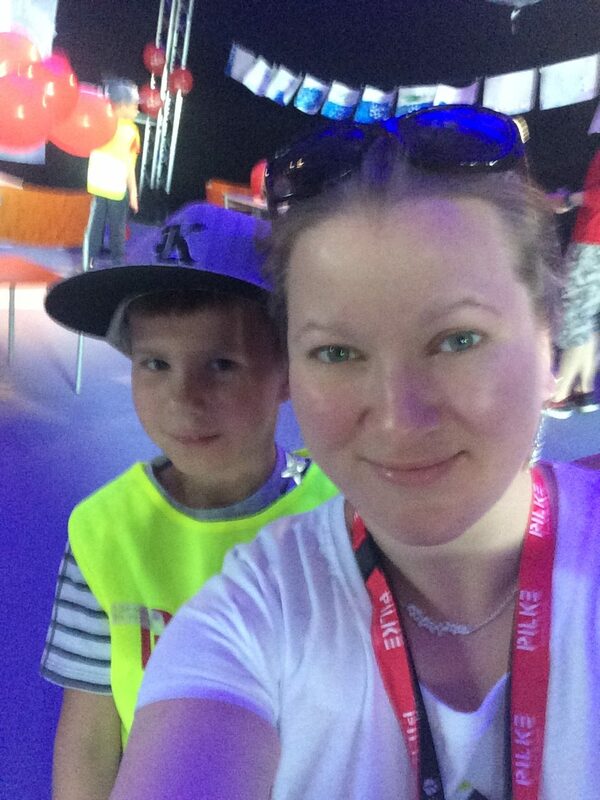 Next day was the time to meet the supervisor, Jarkko. It was a nice meeting where we started to plan our experiments. Me in the laboratory teaching some new techniques to a student (not high school though). 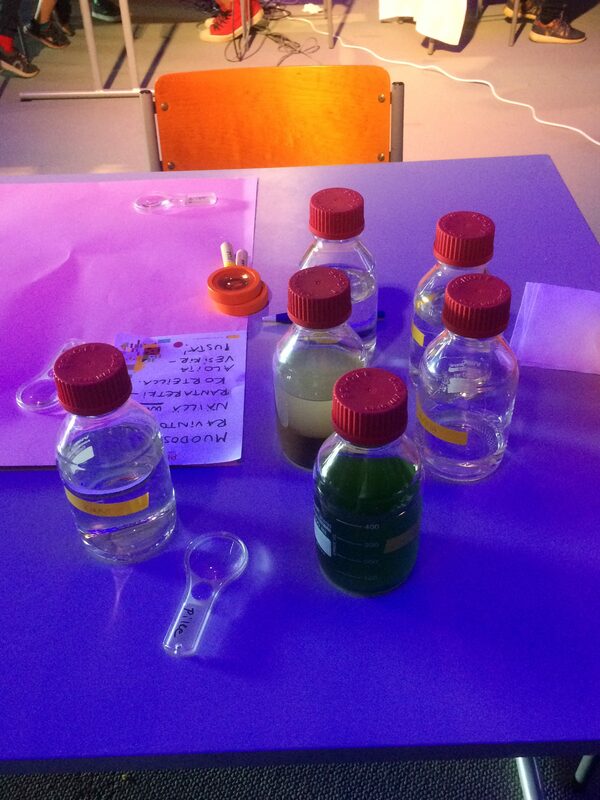 Caffeine and salicylic acid were the compounds that at the end we decided to use for our experiments. Daphnia magna and Lumbriculus variegatus being our test animals. We started acute toxicity test with interesting results. After these good results, we planned to start chronic toxicity tests with Daphnia magna but these were a bit longer that we thought because there were not enough neonates. Some weeks later, the experiments started with the first generation, followed by the second one. 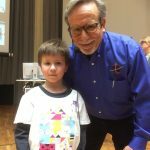 The third generation I could not finish, because my time in Joensuu was over. 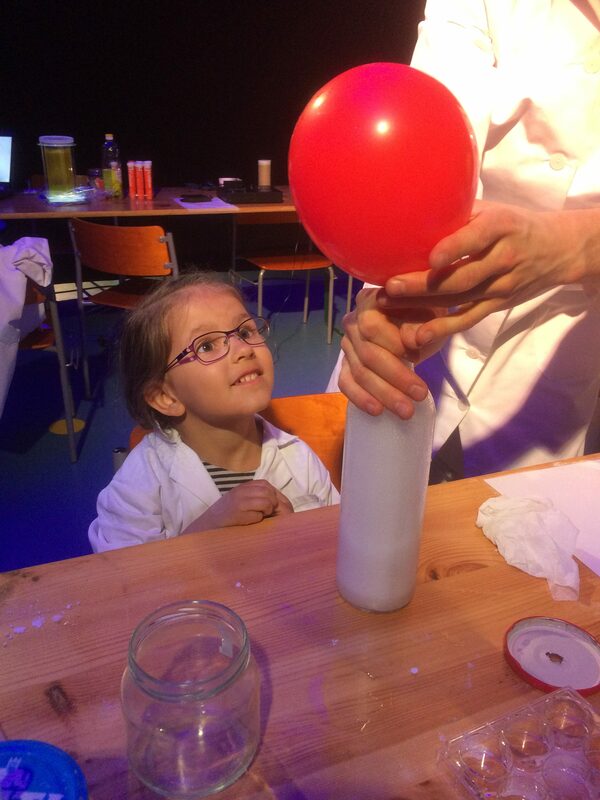 Kukka and Kaisa took care of the rest of the experiment (thank you once again). However, not everything was just laboratory in Joensuu. I started practicing some sports (and I am not taking in consideration the rides to the centre by bike). How can I forget the spinning class with Alex (the first and the last one) or the body pump lessons with Kaisa, where I confess the first time I was afraid but then I liked it. The Finnish Conference in Environmental Science was also nice, where I had two posters and one oral communication. I spent lot of evenings with friends I met in Joensuu in JetSet bar, drinking some beers, playing board games and talking about life, something that I loved. In July, it was amazing the Ilosaarirock festival where I was volunteer and I could enjoy one of my favourite bands, Imagine Dragons. If I have the chance, I would love to come back once again to the festival. 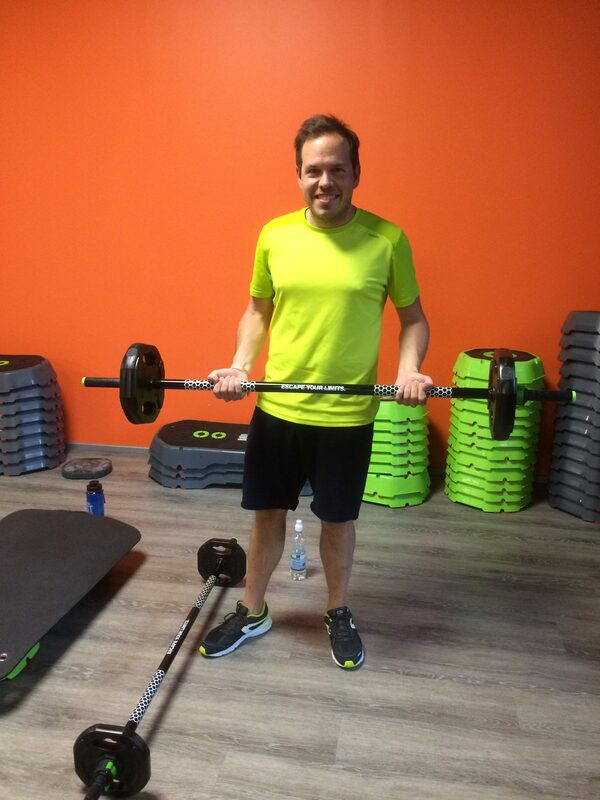 My very first but definitely not the last BodyPump class! August arrived, I had not realized it, and there was not snow anymore. 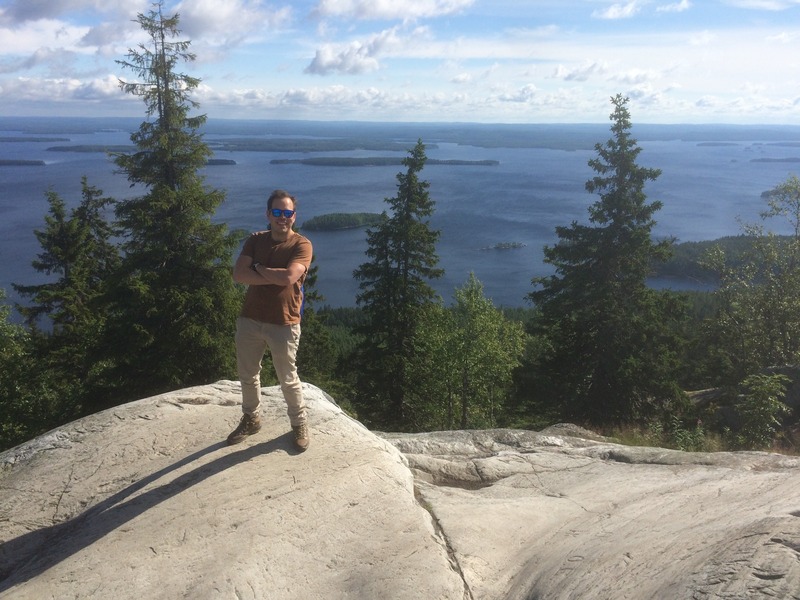 Finally I went to Koli, a beautiful National Park with my lab colleagues, my friends, and I fell in love with those amazing landscapes. The day arrived, 21st of that month, Kaisa picked me up as lot of days during these five months. But this time our destination wasn’t the university for working or hunting Easter eggs, we stopped at the train station. I loaded the suitcases, full of new knowledge, amazing experience and friends while we made the last pictures. The adventure arrived to the end but feeling that I will be back to this city called Joensuu. At Koli National Park with Lake Pielinen behind. Thank you for bringing to me this amazing opportunity. Text by Eric Carmona Martinez. Photos by Eric Carmona Martinez and Kaisa Figueiredo. Two new Phd dissertations from our research group! Our PhD students Kaisa and Krista have been working extra hard within the past few months. There were many exciting moments with writing the dissertations and planning for the public examinations. 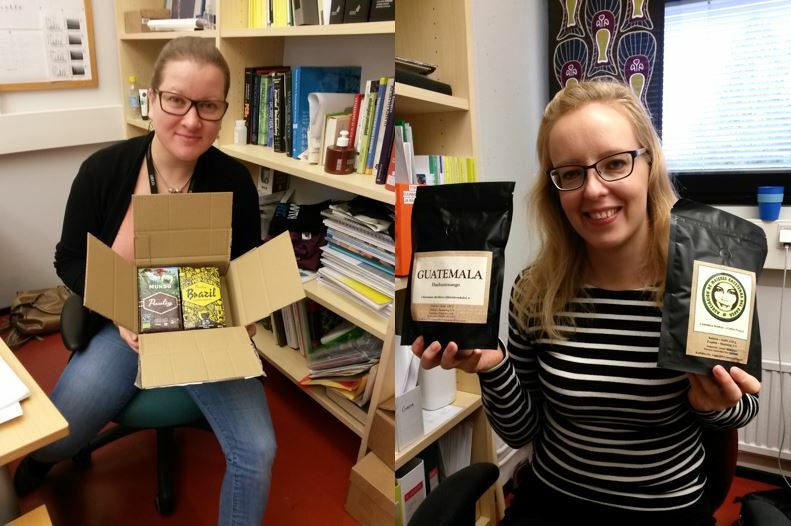 In Finland, the dissertation is first sent to two pre-examiners. They shall give recommendations (is the thesis ready for publication or not) and comments for the final improvements. Then, it is time for final polishing and language editing. Finally, we get the book printed and get ready for the public examination and the evening party, Karonkka. predicting concentrations with models and passive samplers). 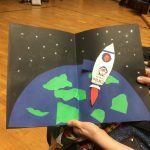 Krista’s final version of the PhD dissertation. Kaisa is on her way to her public examination. The public examination lasts usually from two to three hours and it is a combination of interesting discussions and tough questions. Exciting moments at Kaisa’s public examination. Finally, everything is over and it is time to celebrate. Krista served some sparkling wine and snacks after the examination to celebrate the occasion. 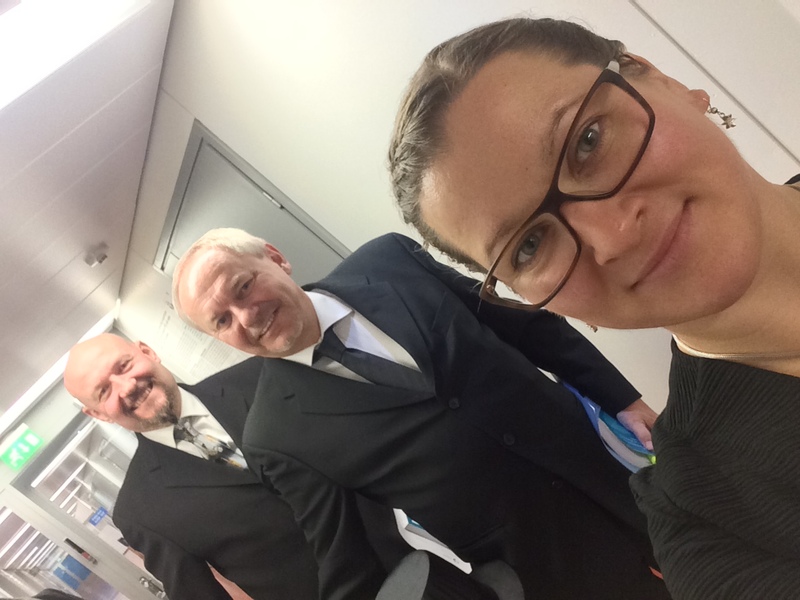 Congratulations to Kaisa, who already obtained her doctoral diploma! Krista’s diploma is still on the way, in the wheels of bureaucracy. Text by Kristiina Väänänen, pictures from various sources (published with the kind permission of the photographers). 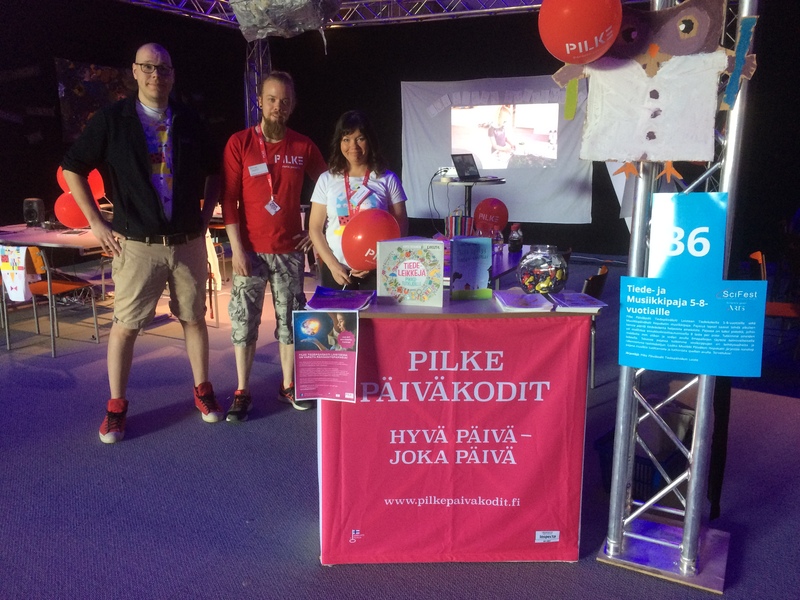 Surviving conference in record-breaking heat – even a panda falls into trance! 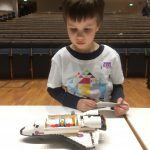 In August last year we wrote a blog post about the 2nd IIES work-shop that took place in Kuopio, Finland. To refresh your memory, you can click yourself to the post HERE. This year was the 3rd year that this kind of a conference is held, and the location changed from chilly Kuopio in Finland to super-hot Shanghai in China. Yes, truly overheated…. 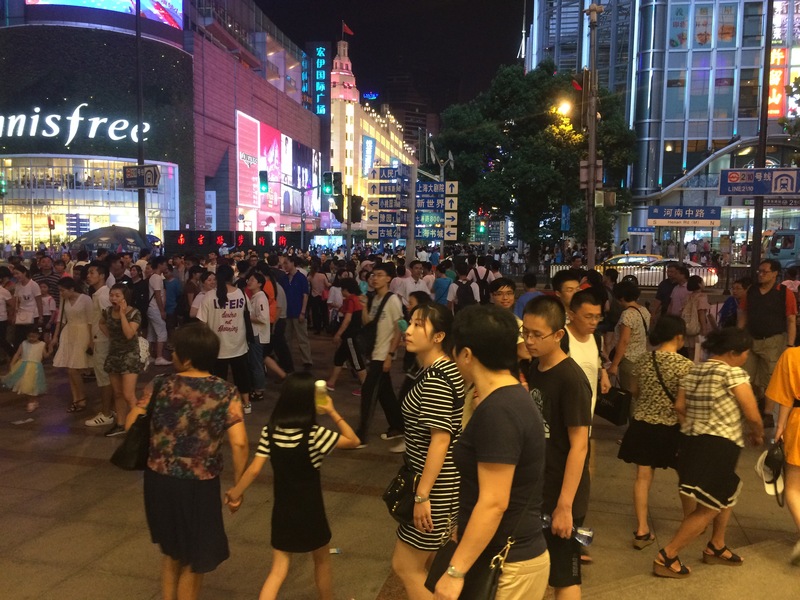 during the conference week, we experienced the hottest day in Shanghai in its recorded history, which is 145 years. City of Shanghai during the record-breaking heatwave. The conference was held at the Shanghai Jiao Tong University, which everyone knows for its Shanghai list of top universities in the world. SJTU is the university that originally compiled and issued the list in 2003, which is not known as renowned Academic Ranking of World Universities, ARWU, being among the most prestigious ones globally. More than 1,200 universities from around the world are evaluated in ARWU ranking. The criteria include, among other things, Nobel and Fields prizes, articles published in Nature and Science, and citations. In the latest 2017 ARWU the University of Helsinki was ranked 56th, being the leader among the Finnish universities. The University of Eastern Finland (UEF) maintained its position and was ranked among the leading 301–400 universities in the world, thus being ranked once again as the second best Finnish university. Aalto University, the University of Oulu and the University of Turku were ranked in the rank range 401–500. Congratulations! Like in the previous years, the top of Shanghai Ranking comprises Harvard University, Stanford University, the University of California, Berkeley, the University of Cambridge, and Massachusetts Institute of Technology, MIT. Here is more information about The Shanghai Ranking. 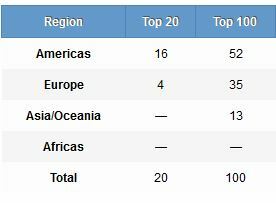 The locations of top 100 universities in the world, by www.shanghairanking.com. Okay, back to the IIES annual workshop. This year the 3rd Annual IIES Science and Policy Workshop was held simultaneously with International Conference on Low Carbon Development—Responding Post-Paris Agreement on Climate Change: Energy Transmission and Innovation which was also being sponsored by the IIES, and Shanghai Jiao Tong University with the GlobalTech Alliance. The two meetings were held simultaneously and offered participants the opportunity to meet colleagues from a wider range of institutions and to participate in both meetings. The participants came from Asia (mostly China, naturally), Europe and North America. There were sessions on atmospheric pollution – health Interactions, collaborative projects – ongoing or prospective, green technology, low carbon economies – technology and policy, soil resources – contamination and remediation, water resources – contamination and remediation. The workshop lasted four days and consisted of interesting presentations, fruitful discussions, conference dinners and informal get-togethers. IIES welcomes everyone to join the workshop next year – although the location remains unknown yet. You can read more about IIES. 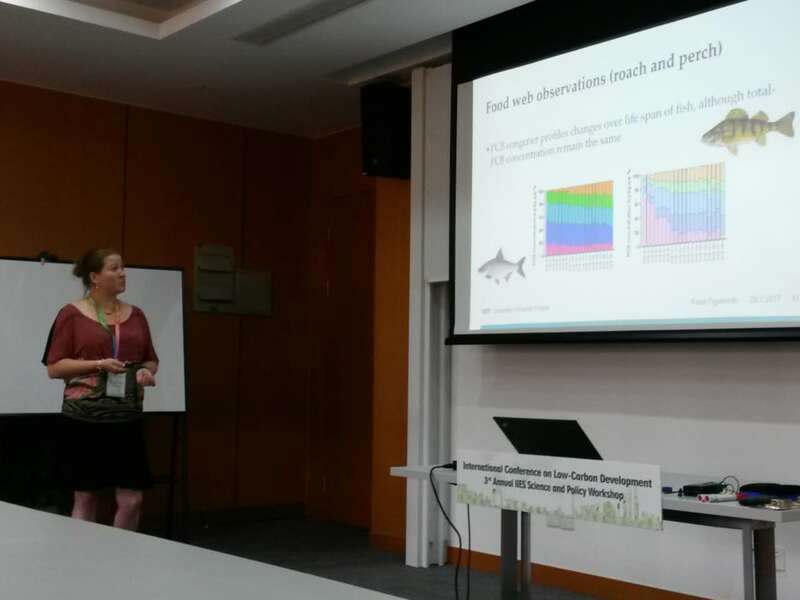 Kaisa giving her presentation at IIES meeting in Shanghai. The Finnish delegation representing UEF this year at the workshop included four PhD students and three senior researchers complemented with two professors. 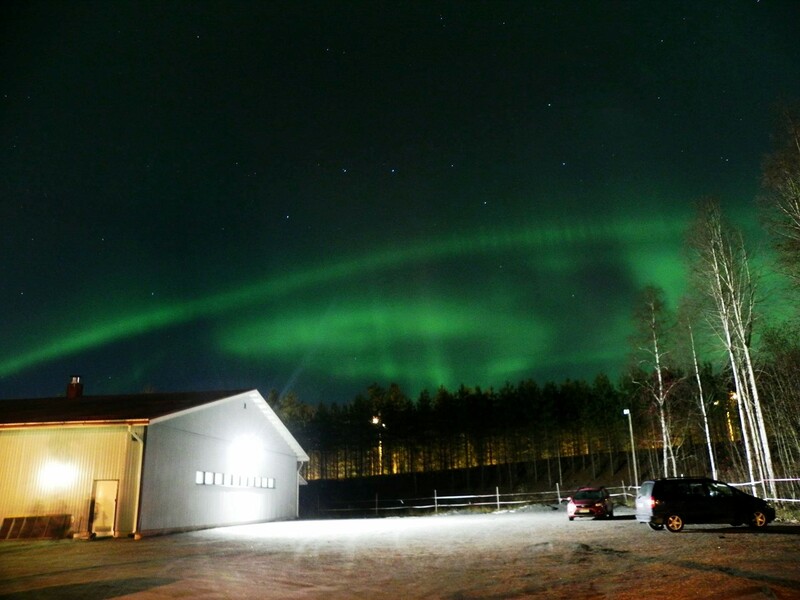 Two researchers from the Finnish Meteorological Institute (FMI) added their forces to the Finnish delegation. 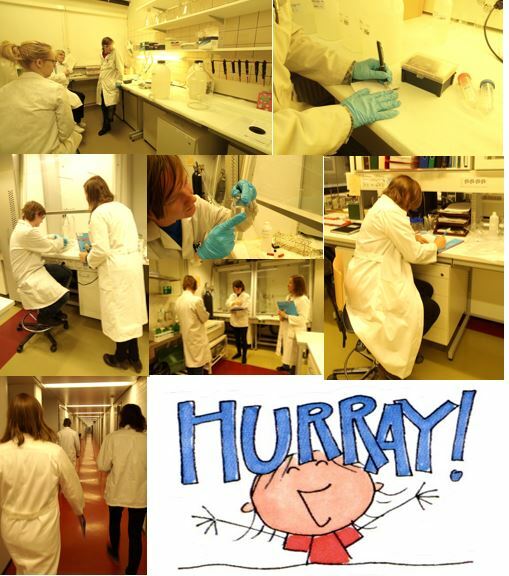 Our ecotox group sent two final stage PhD students, Kristiina and Kaisa, to the venue with great success! 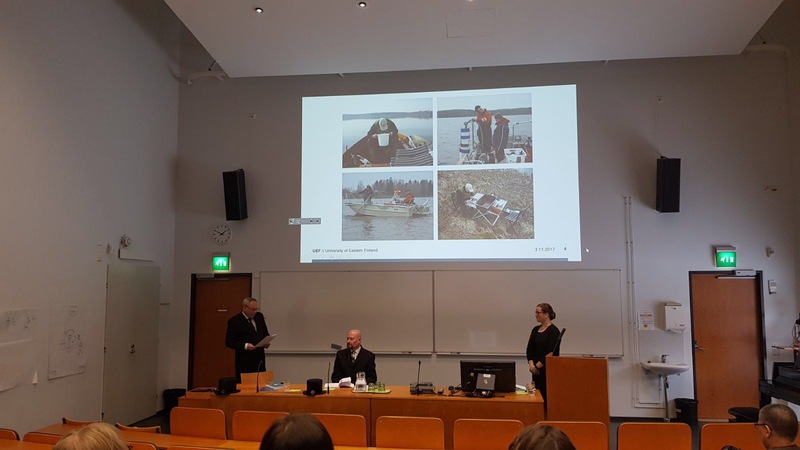 They both had interesting oral presentation regarding their own research areas: Kristiina about metals in environments, and Kaisa about PCBs in aquatic food webs. Both of them had obviously learned the lesson (HERE ) and managed to speak and discuss their topics and co-operate with others with great success. IIES is now starting a post-doc program together with Nanjing University, and who knows, maybe this would be a great possibility in the future also for our soon-to-be PhDs at ecotox research group! 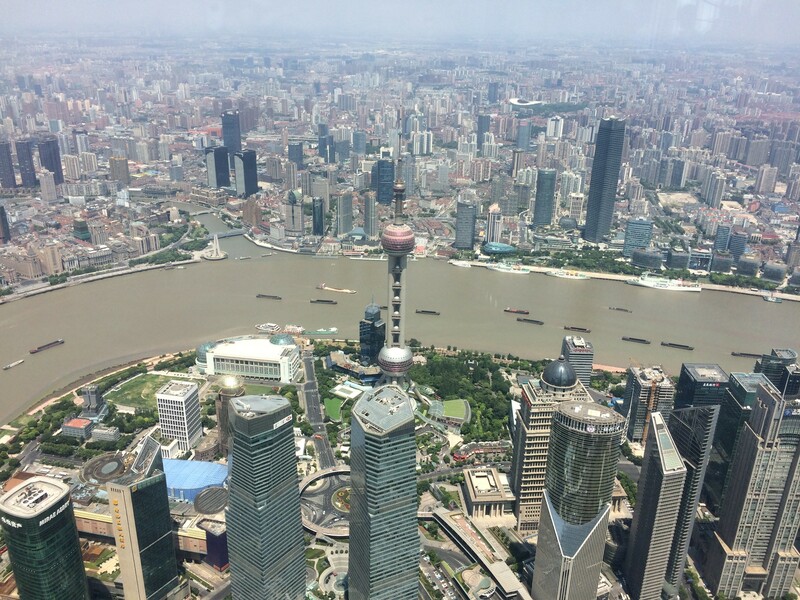 Kristiina visiting the world 2nd tallest building, Shanghai Tower. Total weight loss 13 kilos! Follow-up for our fitness test. Who remembers our blog post from last September about Fitness test truck and body composition measurements? If you have forgotten, you can refresh your memory HERE. Nine months passed, and our motivated and scientifically oriented test group was finally ready for a second measurement, this time in Kuopio. 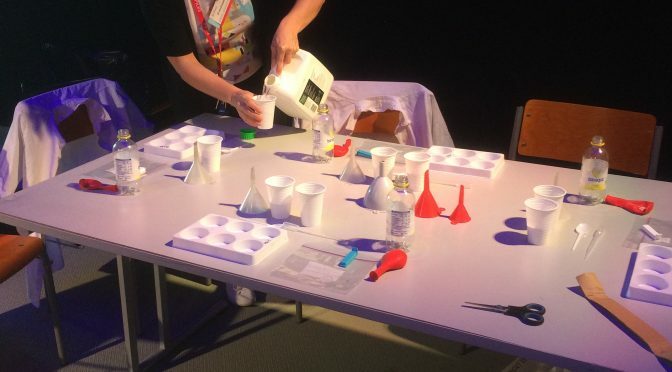 We prepared well for the measurement process: avoiding extra salt and carbohydrates to get rid of the excess of body liquids, wearing light clothes (as light as possible), and leaving from home early in the morning so that we could survive without eating until lunch hour. On our way to Kuopio! Surprisingly happy even without the breakfast. The results were good. Our test member Kaisa had probably the biggest work to do in achieving the ideal weight and body composition, but of course, we all wanted to get good results and have some improvement compared to last autumn’s test results. It was very rewarding to see that healthy lifestyle with lots of aerobic exercise, muscle training, and proper diet, finally results in weight loss, muscle gain and reduced fat percentage. 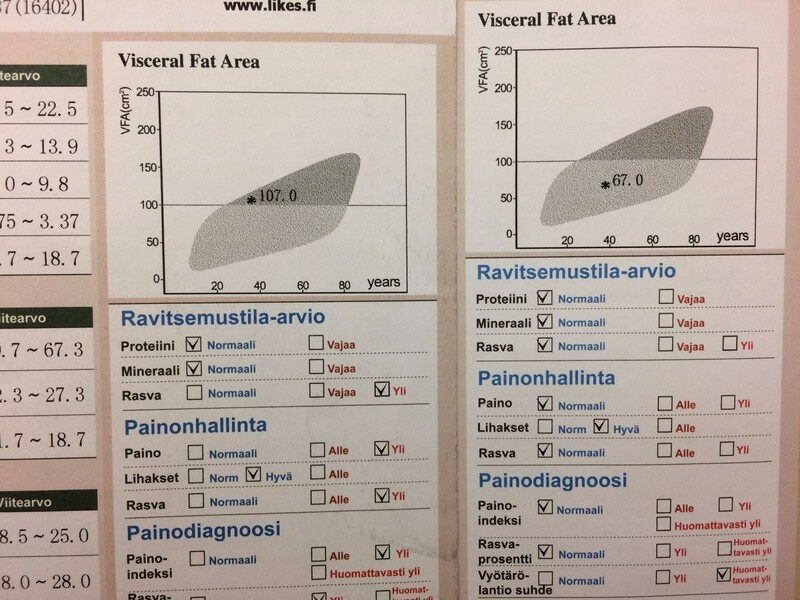 In Kaisa’s case, the fat content of the body had reduced by 7.5 kg, visceral fat had decreased by 30%, and the overall health and fitness index had improved remarkably. The Body Mass Index had reduced by almost three units, and all measurements were within the normal limits, finally. So many good changes seen in the Inbody measurements, when compared to the previous time. During the winter, also Kukka and Kristiina had been working on improving their fitness – with varying success. For Krista, the results were well in line with the lifestyle. She lost some weight (3.2 kg of fat and unfortunately, 1.4 kg of muscle tissue). Well, she had eaten less and done lots of sports. However, besides the regular dancing and badminton, Krista did not find time for gym. It shows in the results! During the summer, she’ll be planning to go to gym at least twice a week, hoping that that will have some kind of effect. Then to the other results: Visceral fat was reduced by 20%, which was great. Also, the maximal oxygen uptake has increased 20% (from average to very good). Overall, her health seems to be quite good and there is no need to lose any more weight. The Fitness test truck shall come again to Joensuu after four months. It will be interesting to see, what kind of results we get during the summer (and holiday). What happened to Kukka? “Need to increase weight by raising a bit of muscles and a even more fat” was said in the previous evaluation. Well, the muscle and bone mass had increased, which is a good thing. With increasing the fat, she was not so successful. ”I’m not sure if I really want to carry recommended 15 box of butter”… Anyway, we think that living at countryside by doing things like digging, carting, lifting, running and so on keeps whoever in a good condition. 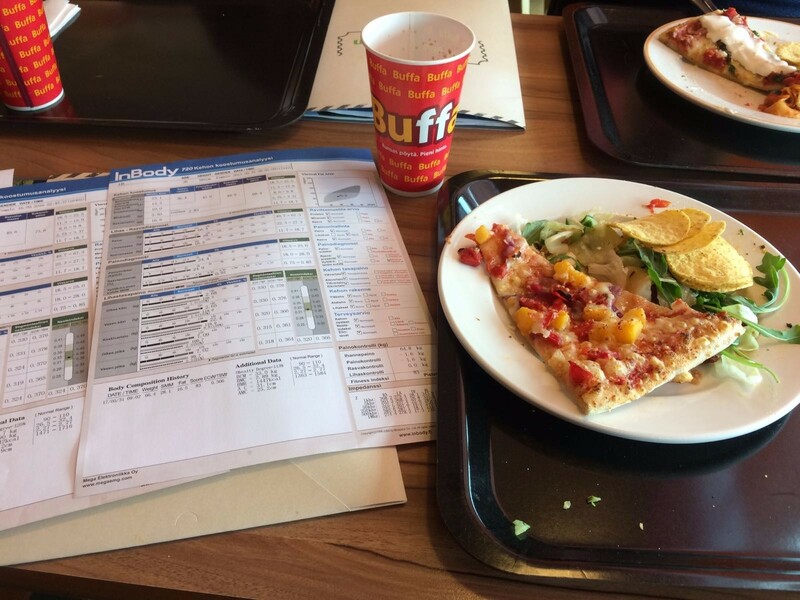 We were so happy about the results that we directed ourselves for a pizza buffet lunch and continued analyzing our results there. 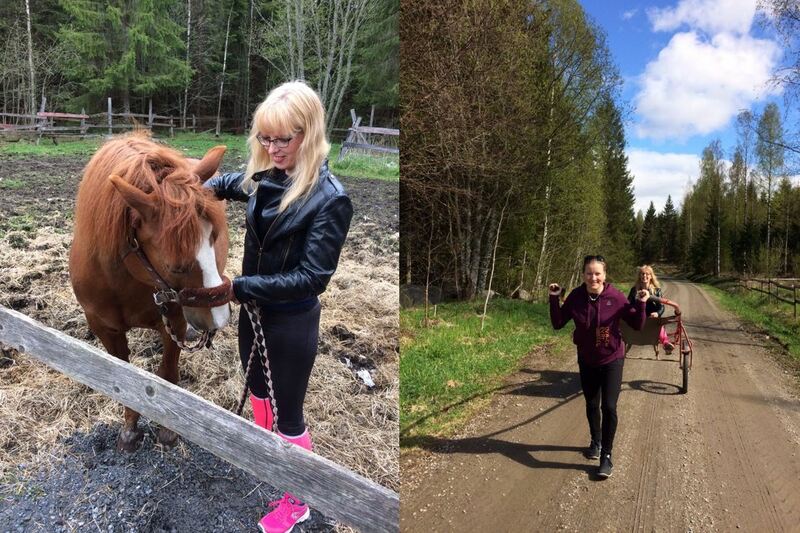 We combined this day with a trip to countryside, where we had an opportunity to pet the cute horses and dogs. Kaisa had a bunch of energy left, so she continued with the sports theme! After all the hard work, it’s time for pizza. Note, we took also some salad. A stopover in countryside. It was the first summer day for this year! Publishing scientific articles is an important part of researcher’s life. 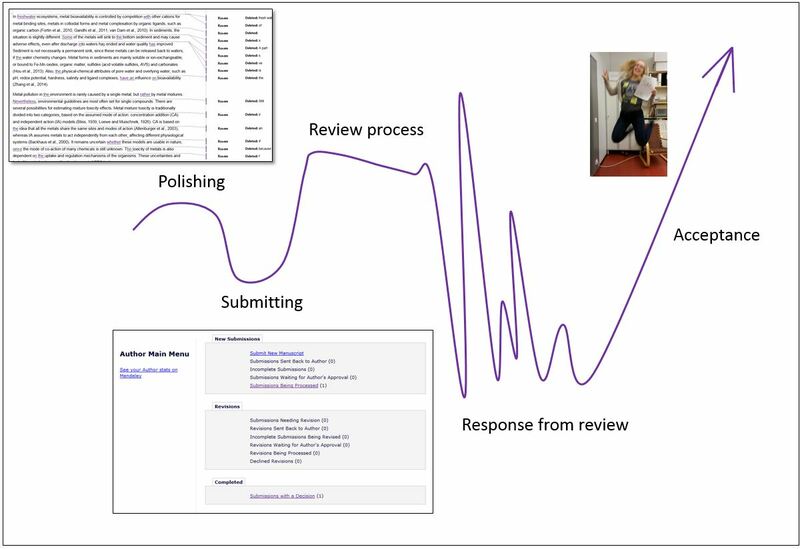 The process is full of ups and downs, especially for a young researcher. Planning and writing the manuscript is another story, but there is lot to expect after you think you have finished your manuscript. The emotional rollecoaster of publishing scientific articles. The final polishing takes a surprisingly long time. Is everything according to the journal’s requirements? Fonts, figures, colors, spacing? Do you need separate files for everything or do you build a single file including figures? What kind of reference formatting is required? For me, this is the happy phase. I feel that my hard work pays off and I am actually finishing a part of my work. I can’t wait to get that manuscript for the reviewers! With my first manuscript, this was the phase where I started to have doubts. You need a cover letter for the editor. What on earth am I supposed to write in there? And how do I find the most suitable referees? So many forms to fill and the figures do not show as I planned. Can I be sure that everything is ready to be submitted? Did I make all the last corrections to the text after the proofreading? Since I am not a native English speaker, there is a bit more stress in that part. Relieved to get the manuscript out of your hand. Expectations are high and the process seems to take way too much time. Unless you get a quick response from editor saying that your manuscript doesn’t fit to the scope of the journal, or that they have recently published a similar paper. Then it’s just waiting. When I finally get the response, my feelings go up and down. Well, of course, if it’s not a blunt rejection. Major of minor changes – Yay, there is light at the end of this tunnel! On the other hand, the comments from the reviewers prove that there is still a lot of work to be done before the article is published. In the end, you will have the paper in your hand, with your name on it and everything. Should I send it to my family to read (didn’t, I guess they wouldn’t appreciate it that much). 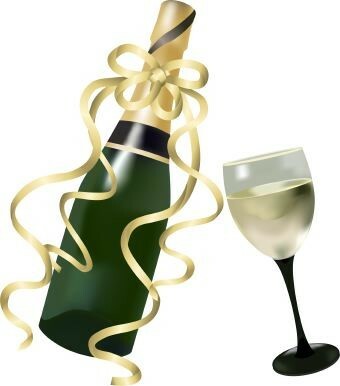 Maybe I could bring some sparkling wine or a cake to colleagues? Part of my PhD thesis is now completed and it’s time to move on to the next part! Celebrate the good work you have done! This fall we have two lab trainees, Risto and Päivi, working in our group. They are studying in North Karelia Adult Education Centre to become laboratory technicians. The education includes both lessons in the college and practical training in work places. Students have to pass altogether six working exams; in laboratory field this means exams in basic lab work, organic chemistry, analytical chemistry, and bioanalytics, and two optional exams among own interests and possibilities in workplace. Our lab offers training in basic lab work, analytical and environmental chemistry, and biotechnical applications as well. During their training period, students are working as a part of our group doing everyday lab works learning new methods and deepen their occupational skills. On the other side, they bring new sights and ideas enriching the workplace. Another benefit is that supervising forces you to think your work thoroughly: how and why different stages in the work are done. It is observing your own manages by another’s eyes. In the best case, interaction with students produce new and practical methods. I hope that those moments are great for students, too. Our old, rather shaky and bulky experiment system (left), and new, compact setup (right) developed by Risto. An important goal for students is to pass work exams during the practical training. Thus, we need to plan “work-packages” for chosen exams. This is a bit difficult part, because many criteria set by the college must be fulfilled for each exam, and the work must be included in the everyday lab work at the same time. In the best situation in exam, students just do their daily work under appraisers’ observing, and then their performance is evaluated. In the exam, there are three appraisers representing both college and workplace. They observe student’s work and ask questions, and finally have a meeting to decide the grade; exciting and interesting event overall. 1) Artificial freshwater for Kristiina’s experiment is under preparing, 2) Risto was asked to calculate some concentrations, 3-4) Doing toxicity test is painstaking job, 5) Centrifuging and telling about the equipment, 6) Observations are booked through the exam day, 7) Going to the evaluation meeting, 8) Finally it’s over! 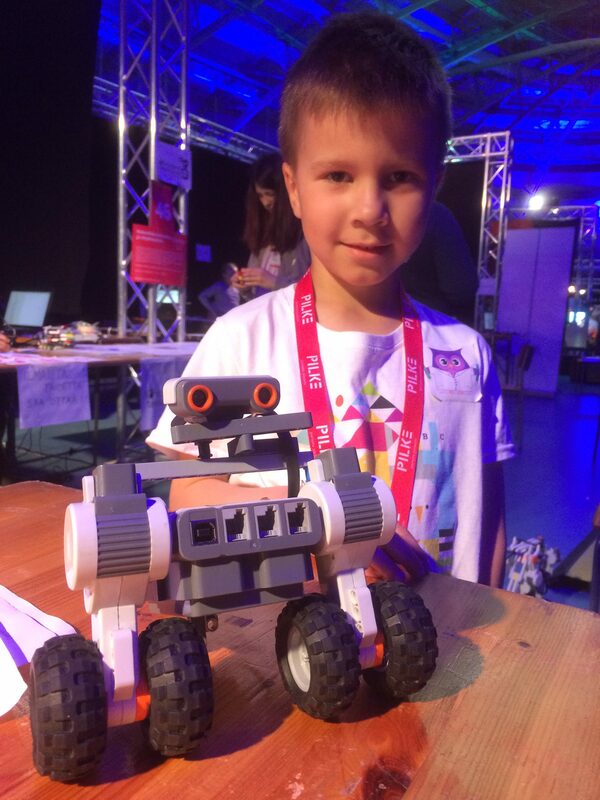 Congratulations for Risto for his great work!